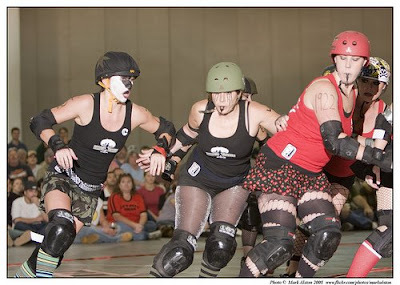 It couldn't last forever: The 2007 Salt City Derby Girls' champion Bomber Babes had their season undefeated streak shattered Saturday night by the very team they whomped back in April: The Leave It to Cleavers, your new 2008 SCDG Champions. In front of a capacity-ish crowd at the Salt Palace, the Bombers led the scoring for most of the bout, until the Cleavers pulled ahead midway through the second half and took it all the way home. It might have been the most exciting game of the season, if not exactly the cleanest: Several skaters were ejected for penalties, including a showboat exit by retiring Cleaver Miss Disco Bliss, who skated through the crowd and out the door, middle fingers high. The local roller-derby season is over, but the SCDG's allstar Shakers are traveling to Sacramento this weekend and could (ahem) use your help/donations for traveling expenses--PayPal ahoy.